This record contains a variety of instrumental pieces including medieval music, folk tunes and early classical music. The oldest are probably the English dance tune 'Trotto' and the Italian 'Saltarello', to which I have added a drone accompaniment, tuning the guitar to DGDGCD. 'Lamento di Tristan' and 'La Rotta' are fourteenth century Italian pieces played originally on vielle. They too are without harmony but have the tune doubled either on sitar or glockenspiel. The three part conductus 'Veri Floris', composed during the Notre Dame period, is a setting for the words 'Under the figure of the true flower which the pure root produced, the loving devotion of our clergy has made a mystical flower constructing an allegorical meaning beyond ordinary useage from the nature of a flower". This is followed by the triple ballade 'Sancuer-Armordolens-Dameparvous' of Guillaume de Machaut. 'Bransle Gay' and 'Bransle de Bourgogne' are from the danceries of Claude Gervaise, composed in about 1550. The first is played on solo guitar but the second uses flute, fiddle and has a second guitar line added. The anonymous 'Alman' is taken from the Fitzwilliam Virginal Book and is followed by 'Melancholy Galliard' by the English lutanist John Dowland. The sequence concludes with the 'Sarabande' in B Minor by J. S. Bach. The album ends with two short guitar pieces, 'The Lady And The Unicorn' and an arrangement of the sixteenth century song 'Westron Wynde', and arrangements for flute, viola and guitar of two folk songs: 'My Johnny Was A Shoemaker' and 'Scarborough Fair'. I have not presumed to reproduce early music as it would originally have been played, but hope nevertheless that the qualities of the music can be enjoyed, though interpreted on more recent instruments. John Renbourn plays guitars and sitar, Terry Cox plays hand-drums and glockenspiel, Don Harper plays viola, Lea Nicholson plays concertina, Tony Roberts and Ray Warleigh play flute and Dave Swarbrick plays violin. 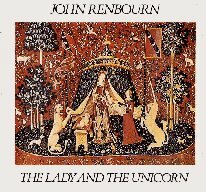 Renbourn's last solo album for the next six years overlaps with his Pentangle work, featuring Terry Cox playing hand drums and glockenspiel, with future John Renbourn band member Tony Roberts and violinist Dave Swarbrick. The repertory consists of medieval and early classical pieces, interspersed with the expected folk material - keyboard works from the Fitzwilliam virginal book (transcribed for guitar) stand alongside traditional tunes such as "Scarborough Fair," which turns up as part of an 11-minute track that also incorporates "My Johnny Was a Shoemaker," with Swarbrick at the top of his form on violin. The album is entirely instrumental, but as with other Renbourn releases, one hardly misses the vocals.